The school was founded on 8th May 1992. Since that time, 15 years have passed, and our small children have grown up. They have chosen different paths through life. And often, whenever they need help, they approach us – like sons and daughters who, even if they are adult, confide in their parents. 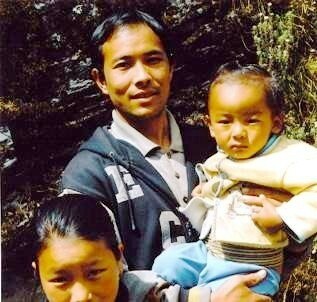 This photograph shows Wangchu with his little son. He is married to his classmate, Maya. As Maya was just helping her parents harvesting potatoes, she could not join her small family for the photograph. Wangchu is our former cook's son. In 1994, at the age of 17, his father took him to Phugmoche. He had never been at school before. Phugmoche offered him a great chance, and Wangchu took it. He has just set his paper manufacturing plant running which produces hand-made paper out of the local Lokta plant, Daphne sp. In addition to that, working as an operator, Wangchu has assumed the responsibility for our hydro power station. Phugmoche School consists of two branches: one which teaches the traditional Buddhism to 23 students, and the other which offers general education to 23 girls and 23 boys as boarders. About 35 day-scholars from the neighbouring settlements attend school in Phugmoche. Quite a few boys out of Phugmoche's 'first generation' prepare for becoming monks. Twelve of our former students receive a religious education in a Tibetan monastic institute in South India. Since Ngawang Tharchin, our young Tulku (a re-born Lama) went to India in 2004, I have been in regular e-mail exchange with them. It is surprising how well our farmers' and yak herders' children write English. Among them, Ngawang Tharchin and Tsewang Rigzin are especially successful. Tsewang is a member of the editorial team which issues the periodical of their institute. On joining the monastery, both young men have taken an oath to themselves not to return home before having completed the nine grades of their spiritual education. Almost all of our young religious students have already lost their fathers or mothers. Tsewang Rigzin is a cousin of Sonam Dolkar's, the girl who received the artificial heart valve. Tsewang thanks us for having given her a new life. He is much concerned about Sonam Dolkar's health. It seems strange to me that it is through me that those young men contact their relatives in the far Himalaya.